Many were upset that ‘Night mode’ went missing on the Nexus 6P and Nexus 5X once the Android Nougat 7.1 beta OTA was installed. After much buzz about the omission of Night mode, Ian Lake from Google spoke about why the feature went missing: “it requires driver support that is no present on Nexus devices,” This was about a couple of weeks ago. “Night Light” feature from Google PixelMany users submitted feedback for the beta (as this is what the program is meant for), and many of them reported the lack of night mode as a bug: saying that night mode should be in the settings, but it is not, and that the issue is happening 100% of the time. Google must have heard everyone loud and clear because today someone at Google has marked the issue as “closed” with a status of “FutureRelease”. This technically means that the issue has been resolved and that the fix for the issue will be applied in a future update. 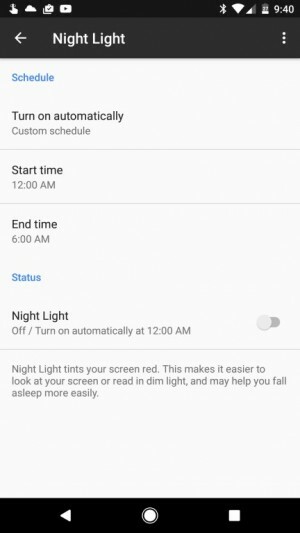 Perhaps Google only removed Night mode because it was inconsistent with the Google Pixel’s “Night Light”, as that’s what it is called on the new phone. In any case, we expect to see the eye strain reduction feature make its way back to the Nexus 6P and 5X on the Beta program. Thanks Google!